That time of year when I attempt to resurrect this blog in the hope of actually writing exclusively about knitting. Each year I’m a little more experienced, a little wiser. Each year I have such amazing expectations I’m seriously doomed to fail. Last year I was unhappy with blogspot in general, so I tried wordpress. That failed miserably, though at the time, I think all my blogs suffered. I found a life hiding in the real world and started focusing on that. I haven’t really lost that life, I just have a bit of spare time now and I’m actually focusing on my knitting. A lot of things have changed since I started this blog a few years ago. One, I don’t really hate scarves anymore. I figured out the reason why I originally hated them. It’s like making a dishcloth, that never fricking ends. So I figured out I like scarves that are interesting, knit on the diagonal, or knit from end to end with 200 plus sts on the needles. It’s exciting and sometimes freakishly boring, but each stitch is progress, and it looks like progress. I apologize for the craptacular photos, I can’t seem to find my camera, anywhere so I’m stuck with my phone until I can get a new one. 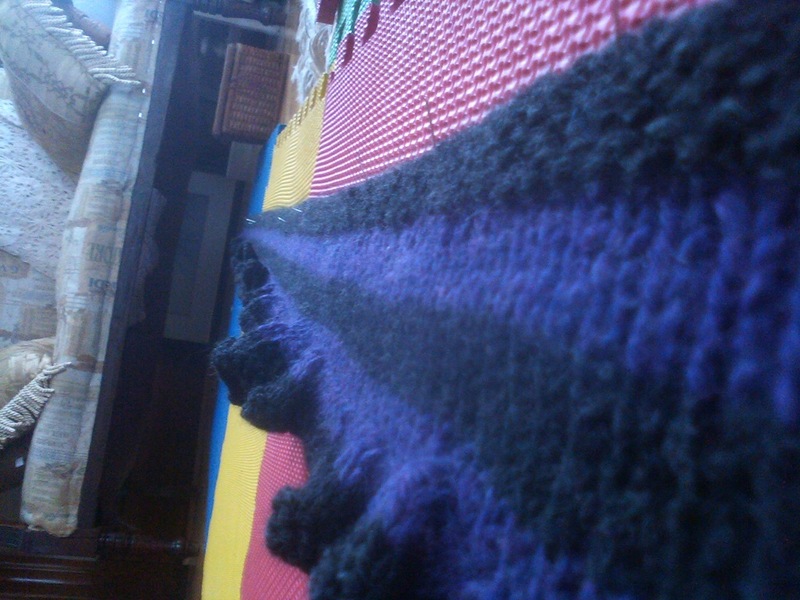 Below is Punk Ruffles, knit in Cascade 220 in Black and Purple Heathers. It took about a week to knit, and was wonderful. I love it. 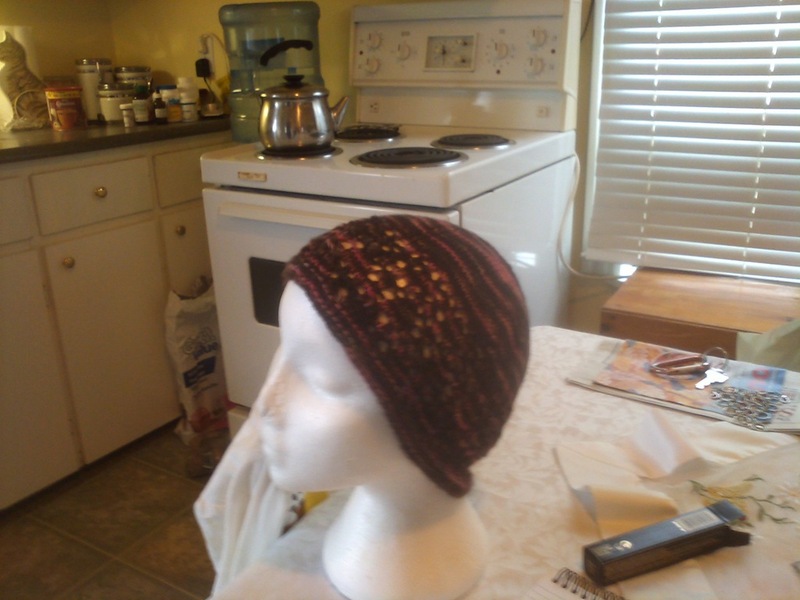 This hat, was knit in Hand Maiden Casbah sock yarn in Marble Mountain. The pattern is Snowdrop Hat, knit in the large pattern. It doesn’t fit my head right, so this is to be a gift. I do have a few things on the needles. I’m working on Podster Gloves for a cousin of mine. I’m also working on test knitting a pair of fingerless mitts for Test knitters on Ravelry. In other news I’ve been on a raverly binge lately. I’m working on getting things set up for the new year to start a new batch of projects. I have a plan (ha!) to start knitting gifts early. And get in the habit of knitting as often as possible. I’m creating a bit of a gift box, and keeping all projects small with a few big ones interspersed to keep things interesting. I’ve got a few things from this year to either frog or finish. Once I find them all I’ll post them. I really need to find my camera, I can’t seem to find it anywhere I’ve been looking all over for it. I suppose it’s time to do a major clean up and really find it. Okay, now I have to start getting ready. I’m working four hours tonight, and I need to clean the kitchen and get things squared away before I go. Also I want to finish that first mitt for the test pattern. Almost finished. Happy holidays everyone, I hope to have another post up before Christmas, but this is a busy week and I can’t promise anything.